With Gutter Guards installed by B & W Roofing on your Atlanta Georgia home or building, your gutters will be zero maintenance! B & W Roofing has been installing top quality gutter guards in Atlanta since 1994. When it comes to Atlanta gutter guards, B & W Roofing offers quick and affordable installation. Stay safe on the ground while B & W Roofing's gutter guards keep leaves and twigs out of your Atlanta gutters. The gutters on your Atlanta home or building have one purpose: Quickly divert rain water away from your roof and away from your foundation. With B & W Roofing installed Atlanta Gutter Guards your gutter will remain free of clogging debris. Allowing your Atlanta building to last longer with less maintenance. B & W Roofing installed Gutter Guards in Atlanta are a wise investment, as they provide years, even decades of protection to your Atlanta gutters and home. Its dangerous work climbing ladders to clean your Atlanta gutters. With B & W Roofing installed Gutter Guards, your Atlanta home or building gutters will basically be maintenance free. No more pulling wet muck while perched on a shaky ladder. No more paying a handyman to clean your Atlanta gutters. You'll retain your time, your money and your health with Gutter Guards on your Atlanta home. Another storms is coming. Will your Atlanta gutters be guarded? Why wait? 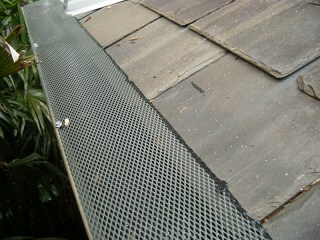 Call B & W Roofing now for a fast, friendly and free quote on Atlanta gutter guards. Protect your Atlanta gutters, home, investment, and health. Call B & W Roofing to install gutter guards on your Atlanta property today!